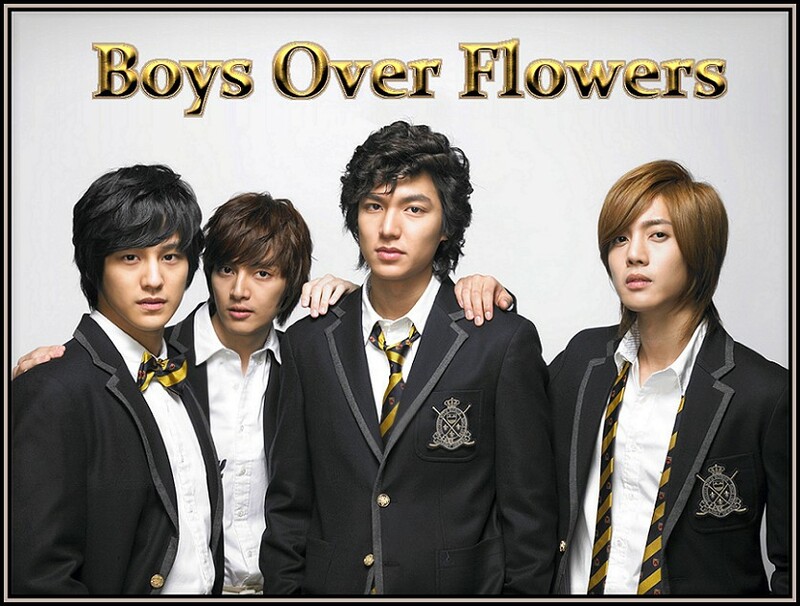 Boys Over Flowers (2009) is no doubt one of the most popular Korean dramas ever made. It consistently ranks in the top ten in viewership numbers on all the websites which host Korean drama, even though, as of this writing ten years later, it has never seen a sequel. Of course many people claim the interest in the show remains high because of its shining lead male star, Min Ho Lee, who plays the role of Jun Pyo Gu, a rich, arrogant schoolboy who thinks the world is his oyster. However, I believe the series remains popular for many more reasons than just its main star, chiefly that many female viewers identify with the spunky main female character, Jan Di Geum, who is very strong morally and who consistently stands up for right against wrong, even when it gets her in trouble with people not nearly as pure of heart as she is. The actress who plays this character, Hye Sun Ku, is not the most stunningly beautiful Korean actress you'll ever see, but she is pretty and sweet and plucky and perfect for the role; those impish eyes of hers are mirrors to the resolute soul of our courageous Jan Di. She perfectly reflects the character traits that the original Japanese shojo manga author Yoko Kamio brought to Jan Di (in Japanese "Tsukushi", meaning "strong weed") in her famous illustrated story Hana Yori Dango. The Korean version is the fifth filmed version of this story and no doubt the most popular around the world, and definitely possessing the best soundtrack (OST), for which many of the cast members sang beautiful songs for the series, and which won Best Soundtrack at the 11th Mnet Asian Music Awards in 2009 (similar to our Grammy Awards). The Story: We first see Jan Di when she is riding her bicycle making a delivery for her father, Il Bong Geum (Suk-hwan Ahn), who is a humble dry cleaner. Things go awry, however, when she sees a young man about to commit suicide by jumping off the top of a school building. She puts her bike down, runs to him, and manages to coax him down and save his life. Crowds of people watch the ordeal. The publicity of her good deed results in Jan Di receiving a free scholarship to attend this school, a very expensive, exclusive private high school that she would never hope to be able to afford otherwise, since her family is poor. Her family are thrilled for her, including her mother Gong Ju (actress Ye Jin Im) and younger brother Kang San (actor Ji Bin Park) and they buy her a uniform for her big day. Not knowing what to expect on her first day of school, Jan Di gets a bit lost and walks through the woods on an indirect pathway to her first class, suddenly spying a beautiful young man playing a violin. She is captivated by him and the beautiful melody he plays, called La Romanesca or "Ji Hoo's Theme". 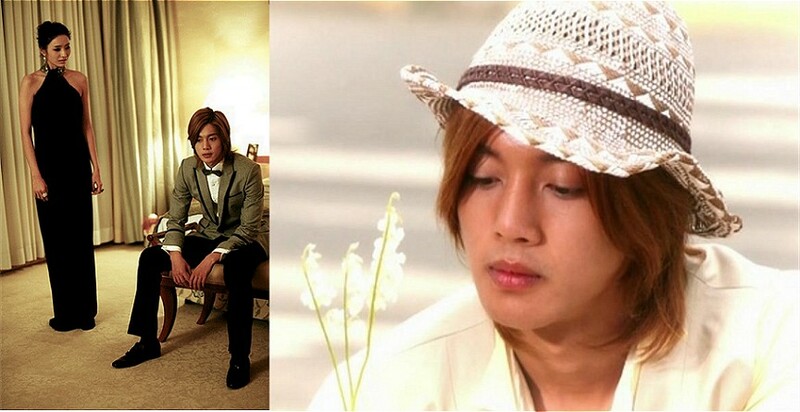 In the school there are several cliques, the main one called F4 which consists of four of the richest "Flower Boys", who have essentially been best friends since childhood: Jun Pyo Gu (Min Ho Lee) the most wealthy of the group and the leader; Ji Hoo Hyun (Hyun Joong Kim) who is the quiet, soft-spoken musician who became withdrawn due to the early deaths of his parents in a car crash; Yi Jeong So (Sang Beom Kim, aka Kim Bum) who has already made a name for himself as a fine craftsman of designer pottery; and Ga Eul Chu (So Eun Kim), a ladies' man whose family owns a large construction firm with ties to the Mafia. Jan Di immediately sees the arrogance and outright cruelty of Jun Pyo against other pupils in the school, chiefly girls who want to give him gifts, which he throws back in their faces as not worthy of him. She finally gathers the courage to tell Jun Pyo off, which results in Jan Di being ostracized and personally attacked by other students at the school who are afraid to cross F4 and Jun Pyo. When several boys attempt to molest Jan Di the quiet knight in shining armor Ji Hoo appears and saves her. By now Jan Di has fallen head over heels in love with the mysterious and gentlemanly Ji Hoo, who is musical and plays not just the violin but the piano and guitar as well. To her Ji Hoo is the most beautiful man she has ever seen. (Can't say I blame her, your second hint as to which boy I liked most!). She has nothing but disgust for the far more arrogant Jun Pyo! Sadly for Jan Di, however, her new friend Ji Hoo is madly in love with another woman, a famous model named Seo-hyun Min (stunning beauty Chae Young Han) who had essentially raised him after the death of his parents in the car crash. She is away a lot for her job but suddenly she returns and Ji Hoo finally gets the courage to admit his romantic feelings for her. (Here we have yet another "Noona Romance" going on - Older Woman, Younger Man). Although Chae Young thinks Jan Di is a better match for her young charge she doesn't exactly turn away from him when he kisses her (a kiss that Jan Di sees through a partially closed door). Ji Hoo ultimately follows Chae Young to Paris the next time she flies there on business, thanking Jan Di for giving him the courage to follow his heart. During all this time Jun Pyo has been intrigued by the feisty Jan Di, who constantly tells him off to his face. Never had he been treated so rudely before! He even had his servants kidnap Jan Di and bring her to his home for a luxurious makeover, including massage, new makeup, hairstyle, clothes, even a new bicycle! but Jan Di tells him that he cannot buy people's affection with money. However, when Ji Hoo leaves and is out of the way, Jan Di finds herself growing closer to Jun Pyo and she even agrees to meet him for a date, which results in them being locked in an elevator enclosure for a night when the night watchman mistakenly locks them in together. Jun Pyo thinks he has grown so close to Jan Di that he announces to the whole school that she is now his girlfriend and is to be treated with the utmost respect. This doesn't please a certain female clique, the "Mean Girls Trio" (Ginger, Sunny, Miranda), comprised of girls who are crazy about everything Jun Pyo says and does (they reminded me of the trio of silly girls who fawned over "Gaston" in Beauty and the Beast). They think Jun Pyo is their property, not Jan Di's, and continue to give her a hard time. (The actress who played "Sunny" in this group, Ja-yeon Jang, committed suicide the year Boys Over Flowers was made, leaving a 7 page suicide letter saying she had been sexually abused and beaten by a number of entertainment producers in her production company. She hung herself. Most of the cast members attended her funeral). What hurts Jan Di even more, however, is the betrayal of someone she thought her only friend in the school, a girl named Min-ji Oh, who becomes unhinged when she discovers Jun Pyo actually likes Jan Di -- she had been in love with him when they were both in school together as children -- and had even undergone several plastic surgeries to make herself prettier just for Jun Pyo (who still didn't give her the time of day). Secretly Min-ji conspires with a male friend to make it look like Jan Di slept with him after going to a bar, but it was all a set up. They had drugged her beer and knocked her out and taken pictures of them in bed together while Jan Di was passed out. Then they made the pictures public and Jun Pyo initially thinks she betrayed him, but the other F4 boys, who have also grown fond of the feisty Jan Di by this time, do their own private investigations of the incident and uncover the truth. Min-ji is expelled from the school in disgrace and Jan Di's reputation is restored. Ji Hoo ultimately returns to Korea to find Jan Di has grown closer to Jun Pyo. He had realized just what Jan Di meant to him while he was away in Paris. With Chae Young gone all the time for her modeling jobs and active social life she didn't have time for Ji Hoo at all, so he would sit in an empty apartment alone for days on end. Finally Chae Young had announced her engagement to a French politician. Ji Hoo's schoolboy crush on her is over and back to the school he goes, but things are not the same and he has to compete with Jun Pyo for Jan Di's affections. Egged on by Jun Pyo's fun older sister Jun Hee Gu (actress Hyun Joo Kim), who really likes and supports Jan Di as the best girlfriend for her rudderless brother, the boys grudgingly agree to hold a kind of contest where they both compete in several sports to see who will win the girl! Ji Hoo amazingly wins (everyone knows Jun Pyo is the athlete, while Ji Hoo is the musician) and he invites Jan Di on an official first date, but ironically they end up in the same elevator where Jan Di had spent the night with Jun Pyo and all she can think about is him. Realizing where Jan Di's feelings are now, Ji Hoo does the gentlemanly thing and releases her to his best friend. Motto of this story: when you have an opportunity to be with the person who loves you, grab that person and never look back! or someone else may try and take your place. Ji Hoo essentially has to silently suffer the slings and arrows of a private love for Jan Di through the rest of the story. Meanwhile, one of the other F4 members, Yi Jeong (Kim Bum), is starting to find himself attracted to Jan Di's sweet best friend Ga Eul Chu (So Eun Kim) who works with her part-time in a small cafe as a waitress. When Ga Eul's boyfriend cheats on her it's Yi Jeong who comforts her. Their relationship deepens with time, after many ups and downs, since Yi Jeong warns her he doesn't really believe in true love, while Ga Eul states she will wait for her "soulmate" before committing to anyone. Jan Di's warm and wonderful family are so excited that she is dating the wealthy Jun Pyo. They make him home cooked meals including kimchi, Korea's most famous dish, and let him sleep over with the entire family in one bedroom! This is the first time Jun Pyo has ever experienced what a real loving family is like. His cold, hard-hearted mother Hee Soo Kang (actress Hye Young Lee from I'm Sorry, I Love You) only lives for power and money and she will stop at nothing to pry Jun Pyo away from Jan Di. She manages to get him away from her for six months on the pretext that he should learn the business of her company Shinhwa Group. She tries to set him up with the daughter of a wealthy family, Jae Kyung Ha (wonderful actress Min Jung Lee, whose antics made me giggle like a madwoman! ), and while Jun Pyo is rather fond of her (he calls her "Monkey"), because she is just so darn likeable, he fights his mother's plans to make her his fiance, for in his heart he is still committed to Jan Di. "Monkey" is SO nice that she eventually simply accepts defeat gracefully and walks away from Jun Pyo and moves to America, freeing him to be with the girl he loves. Completely unlike most Korean dramas where the "other woman" is rather bitchy and tries to hold on till the bitter end! What a refreshing change. "Monkey" was one of my favorite characters in the entire show and I missed her when she was gone. She brought great levity to the show mid-way through when it needed a shot of adrenaline. The show is 25 long episodes so in any show that long there can be lags in the story line. Whoever thought to bring "Monkey" in for some levity to the more serious situations in the plot, THANK YOU! Jan Di had loved to train as a swimmer but an accident ruins her talent in that area so she has to refocus her energies on something else to love. She chooses to start studying medicine and she volunteers at a medical clinic for the poor. An older gentleman who runs the clinic named Seok Young Yoon (veteran actor Jung Gil Lee) turns out to be Ji Hoo's grandfather whom he hasn't seen in years. The grandfather had blamed poor Ji Hoo for his son's death in the car crash, because he had distracted his father while he was driving. After an initial blow-up Ji Hoo and his grandfather forgive each other and start to build a new relationship, and then Ji Hoo develops an interest in medicine as well. This throws Jan Di and Ji Hoo together in a field where they have mutual interests. On a visit together to a monastery a wise old monk takes Ji Hoo aside after meeting Jan Di and tells him that one day he will marry her and build a family with her. Ji Hoo is astonished at this divine revelation from the holy man and carefully guards the prediction away in his heart. Jan Di is still in love with Jun Pyo but when will he ever settle down? He shows no sign of doing so. In fact when he finally gets up the courage to tell Jan Di he loves her he then says he will leave for America for four years to help build his family's company in the West first, and then he will come back and marry her. By this time I was MAJORLY in Ji Hoo's corner to win the girl! (My fourth clue to tell you which boy I preferred for Jan Di!). I will lay my cards down on the table: Ji Hoo would make MUCH better husband material than the flighty Jun Pyo! Jun Pyo is cute and all, and his character does change for the better, but you can't build a solid, long-term relationship when someone is constantly leaving you; it will fail. Our last scene in the drama shows all the boys and Jan Di on the beach together after Jun Pyo has returned to Korea four years later. Jan Di and Ji Hoo are in their white medical coats. Jun Pyo bows down on one knee and takes out a ring to propose ... but Jan Di never actually says, "Yes, I will marry you." She and all the "boys", who are now grown men, turn and face the ocean together and .... that's it! A totally non-committal ending! I suspect they thought a sequel would be done shortly thereafter, so they could tie up loose ends, but now it is ten years later and still no sequel. I don't think we will ever see one at this point; all the actors have moved on to different projects and become more mature. This is now a show from their youth. Yes, I liked Jun Pyo, here's a picture of him with Jan Di, but I LOVED Ji Hoo. (I've always been a sucker for musician types!). One good thing about the way Boys Over Flowers ended is that I am free to imagine what I like, and I'd prefer to think the monk was right and Jan Di and Ji Hoo end up married and build a family together. (Maybe if Jun Pyo is lucky he can track down "Monkey" and win her back. She would give him a lively time of it, I'm sure!). Definitely put Boys Over Flowers on your queue of Korean dramas to watch. It's an Essential K-drama because of its historical significance. I have only skimmed the surface of this landmark show. There are many more side characters, and plot twists and turns that I didn't even go into, not to mention the wonderful location shots at exotic locales like Macao. Those scenes were beautifully done, very haunting, like when Jun Pyo flies Jan Di in his private yet over island farmland near Macao and shows her a huge heart shape carved into the ground below. It's terrific, dizzying eye candy to be in the company of the likes of Min Ho Lee and Kim Bum and especially Hyun Joong Kim for twenty-five hours. Mmmmm .... better than chocolate! The only other main criticism I would make of the show, besides its open ending, is that they didn't give the fourth F4 boy, Ga Eul, that much of a story line. I felt so sorry for that actor, So Eun Kim, all he really did was follow the other boys around. He deserved to have his own significant special story line, instead of being an afterthought. Kim's performance in "Boys Over Flowers" earned him both the "Best Actor Award" at the 2009 Seoul International Drama Awards, even over Lee Min Ho, and the "Popularity Award" at the 45th Annual Baeksang Arts Awards. Lee Min Ho won Best Actor that year at Baeksang. Sweetie pie actress Hye Sun Ku won Best Actress In A Mid-Length Drama at the KBS Drama Awards that year, as well as the Best Netizen Award.